Mahallati’s enlightened work soothes the tensions that often emerge in contemporary art. Effortlessly, Mahallati merges realism with abstraction for a stunning combination of practicality and intangibility. Her work seems to start with something definite and then gravitates toward something more elusive. She paints people, but no faces; animals, but no detail; landscapes, but no clarity. Mahallati is endlessly able to blend two contrasting styles of art and appeal to fans of both. Her growing popularity is due, in large part, to her ability to bridge gaps in post-modern art. 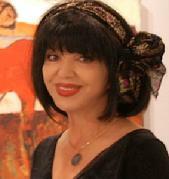 As a girl growing up in Persia, she was influenced by her multi-cultural surroundings. Persia’s rich and extensive history deeply impacted her artistic expression. However, when she was old enough, Mahallati left her birthplace for opportunities that would have been unavailable to her as a woman in Persia, an ultra-conservative country. She fearlessly pursued an education by earning a bachelor’s from the University of Tehran. After that significant milestone, this brilliantly driven woman found herself studying for a master’s degree at American International College. Unsatisfied with how far she had come, Mahallati continued her already impressive education by getting a doctorate from the University of Massachusetts. Her paintings get their power from their simplicity. Mahallati’s gorgeous art expresses a number of relatable themes. Passion is portrayed throughout her work in varying degrees of heat. Mahallati pulls from a dramatic pallet of colors to stir ardor in onlookers.